Quito is located in the Andes mountain range 2.800 meters above sea level, Quito occupies a plateau of 12.000 square kilometers. Its environmental temperature oscillates between 50 to 77 degrees Fahrenheit (10 to 25 centigrade degrees). The climatic contrasts that are presented during the course of a day, allows one to enjoy the four seasons of the year around the clock - as if having eternal spring. 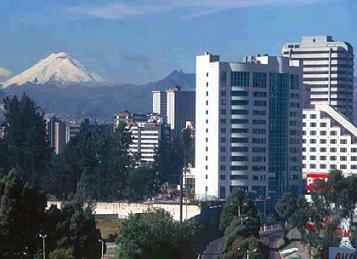 Also, the city is surrounded by the Cotopaxi volcano and Pichincha, Antizana, Cayambe volcanoes that make up the majestic Andean contour.